Gayatri Jayanti is dedicated to Goddess Gayatri who is worshipped as Veda Mata or the mother of Vedas, Dev Mata and Vishwa Mata. A holy transcript says that Goddess Gayatri is considered as Brahma, Vishnu, Shiva and Vedas. 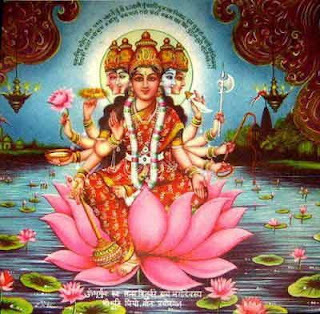 Her four heads represents the four Vedas and fifth one represents the almighty and the Goddess Gayatri is seated on lotus. Goddess Gayatri, who is regarded as the Mother of all Vedas has ten hands and five heads. The ten hands of Goddess Gayatri have the Lord Vishnu symbols. Gayatri Mata is believed to be second consort of Lord Brahma. The appearing of Goddess Gayatri on the 11th day of the Shukla Paksha of Jyeshta month marks the celebration of Gayatri Jayanti in the form of knowledge. It's religious importance lies in the fact that Sage Vishwamitra first uttered the Gayatri Mantra on the Gayatri Jayanti day and the knowledge was shared by Sage Vishwamitra to the world and thus it helped in removing ignorance. Gayatri Jayanti is celebrated in respect of Aadi-shakti Gayatri. It is believed that whole Universe is originated by Goddess Gayatri. 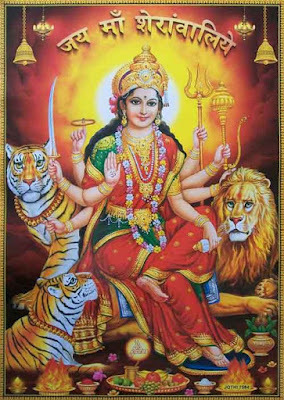 Special prayers, satsangs, bhajans and pujas are organised in honour of Maa Gayatri. Gayatri mantra is chanted in high spirits on this day of Gayatri Mantra. Such is the importance and significance of Gayatri mantra that if one chants the Gayatri mantra then no other mantras are needed to be chanted because this mantra is highly sacred. To achieve best results from the Gayatri mantra, a person needs to recite it thrice a day, preferably in the morning, afternoon and evening. Chanting the Gayatri mantra continously would help the chanter in facing the miseries and hardships of life. Gayatri jayanti day is also celebrated as the day of Ganga Avataran or Ganga Dussehra. Gayatri Mantra is referred in the Rig Veda, written in Sanskrit about 2500 to 3500 years ago, and the Gayatri mantra was chanted for many centuries before that. Gayatri Mantra is chanted, meditated and sung around the world with reverence and love. As a gift from Sage Vishwamitra to all humanity, it is said that this sacred prayer travels through the entire universe from the heart of the person chanting the mantra, appealing for peace and divine wisdom for all. Gayatri Mantra says "May the divine light of the Supreme Being illuminate our intellect, to lead us along a path of righteousness". According to the Vedas, "Chanting Gayatri Mantra purifies the chanter and listening to the Gayatri Mantra purifies the listener. The Gayatri Mantra touches not only the mind but also the soul and is considered as one of the most powerful ways to touching God. The word Gayatri is derived from the words: gaya, meaning “vital energies” and trâyate, meaning “preserves, protects, gives deliverance, grants liberation”. Thus the two words "Gayatri Mantra" might be translated as “a prayer of praise that awakens the vital energies and gives liberation and deliverance from ignorance”. Gayatri Mantra in english means that "We meditate on the glory of the Creator; Who has created the Universe; Who is worthy of Worship; Who is the embodiment of Knowledge and Light; Who is the remover of Sin and Ignorance; May He open our hearts and enlighten our Intellect. This mantra when uttered properly create specific vibrations and powers of righteous wisdom. In the Hindu mythology, many sages gained spiritual powers with years of meditation chanting the Gayatri Mantra.